Officials said the unique piece will infuse „3-D elements“ with colorful abstractions, a combination of wall-painting and sculpture. Renderings suggest it will span roughly 10 stories. 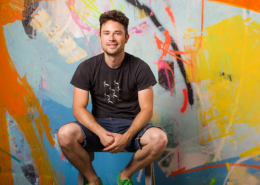 A product of Candler Park and Grady High School, HENSE rose from Atlanta’s graffiti scene to international acclaim and has received other commissions from companies such as Facebook and Apple. 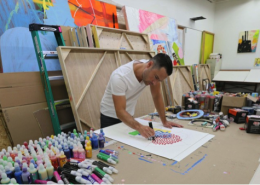 Meanwhile, Michael Habachy is designing Apogee Midtown’s interior, incorporating art elements such as ceramic blooms, abstract paintings, and sculptures from various artists, officials said. Midtown tower in Atlanta will incorporate giant HENSE mural with ‘3-D elements’. 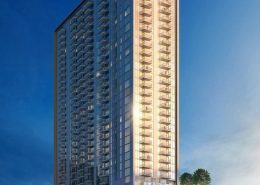 An apartment sky-rise that’s climbing at a prominent Midtown corner will feature an immense mural that developers hope will serve as a gateway to Atlanta’s arts district, officials announced today. Related Development has christened the 39-story tower at 14th and West Peachtree streets "Apogee Midtown." 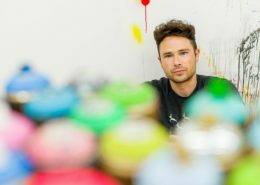 Along with a neighboring, multi-story Whole Foods Market flagship, the project will incorporate a mural by artist HENSE — aka, the homegrown Alex Brewer — that will measure almost 100-feet high and 63-feet wide. As an international, award-winning artist who went from graffiti art to being commissioned by Apple and Facebook for your signature installations, you don’t approach clients for work—they approach you. 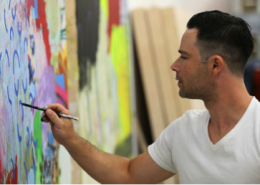 Atlanta-based contemporary artist Alex Brewer, also known as “HENSE,” has articulately united the madness of fine arts with the stoicism of architecture for 20+ years; only now, his works are on an international scale, as abstract installations in various mediums.